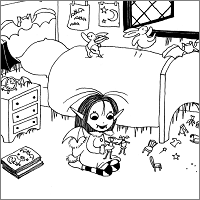 Have fun colouring in these scenes from the Isadora Moon books. 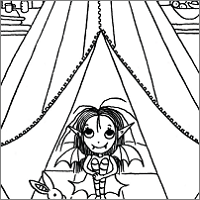 Isadora loves playing in her tent at home. 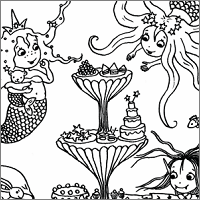 Isadora and Pink Rabbit join two mermaids for tea. 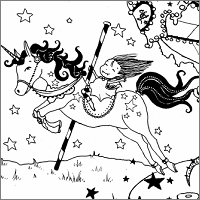 Join Isadora on her trip to the fairground. Transform Isadora's room into a winter wonderland! 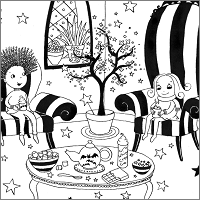 Have hot chocolate with Isadora and her friends in this winter scene. 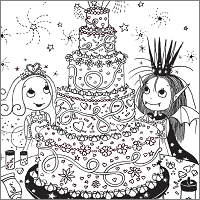 Help Isadora decorate this enormous birthday cake.